We don’t currently have any more group courses for Lightroom training scheduled, but many of our clients prefer to have personalised one to one training. One to one training can be carried out at a time and place to suit you – even in your own home working with your own computer. See here for more details of our one to one Lightroom training. 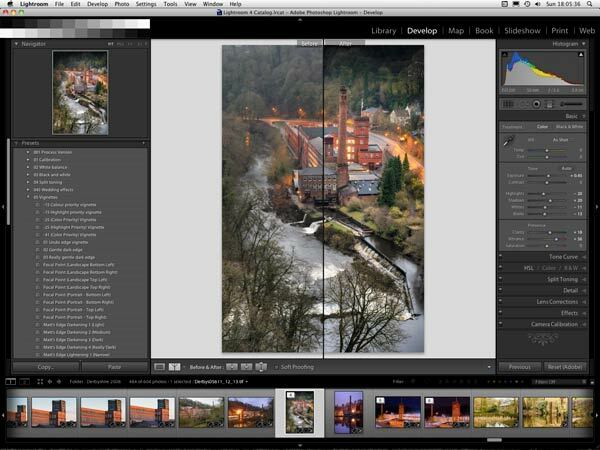 Our Lightroom courses are held near Matlock in Derbyshire, which is convenient for photographers anywhere in the county, as well as from Sheffield, Manchester or Nottinghamshire. There is a maximum of only six people on each of our group courses, with places costing £90.00 per person. Lightroom does all this while at the same time protecting your original files so that you never overwrite or degrade them (particularly important for JPEG shooters), and without you having to fill up your computer’s hard drive with lots of extra copies in different file formats (particularly important for users with smaller capacity SSDs or laptops). Many photographers say they just want their photos to look like the scene they saw when they took the picture. Unfortunately, due to the difference between camera sensors and the human eye, this is often not possible – and leads to disappointment with the results straight out of the camera. To take your images to the next level, you need to learn how to edit them. Fortunately, this has become easier in recent years as the software has improved and become more user-friendly, and Adobe Lightroom is the software that we recommend as the best choice for photographers regardless of their level of experience. Lightroom is part of a new generation of software for organizing, editing and sharing the large numbers of images that we create in the digital age. It was designed specifically for photographers – whether they shoot in JPEG or RAW format, or work on a PC or Mac computer. Compared to older style photo editors (such as Photoshop and Photoshop Elements), Lightroom’s controls are much more intuitive – making it easier and quicker to learn. Our training will teach you to do things in Lightroom that it would take you days or weeks to learn how to do in Photoshop or Elements. Because it was designed specifically for digital photographers, Lightroom has none of the clutter that is irrelevant to their needs, so it’s interface is more elegant and simplified. Yet it is powerful and flexible enough to meet the needs of both amateur and professional photographers, who find that they can do most – if not all – that they want to do within Lightroom. And for those occasions when you do need features that Lightroom doesn’t have, it integrates extremely well with traditional editors (such as Photoshop or Photoshop Elements) – as well as an ever-growing number of third party software plug-ins. If you would like to be kept informed of all the courses we are running, please sign up to our newsletter, and you will be notified as soon as new course dates are announced.